Gather the entire family, grab some snacks, bring a blanket and stake out a spot on the Upper Noe athletic field on Saturday, September 17 for our first-ever outdoor Movie Night. The feature film is Inside Out, an animated comedy/adventure that takes place in San Francisco and reaches audiences of every age group. Sutter Health-CPMC 2020 in partnership with the Friends of the Noe Valley Recreation Center is proud to host this free event. Movie time will be 7 p.m. or dusk, whichever comes first, but neighbors are welcome to show up as early as 6:00 p.m. to find seating and enjoy juggling and hula-hoop entertainers from the San Francisco Circus School. The first 250 families will also receive a goody bag with surprises and treats. Upper Noe resident Emily Avila, principal at Calypso Communications, is working with CPMC 2020 to bring the Movies in the Park series communities surrounding the site of the new hospital, currently under construction at Cesar Chavez and Valencia, and scheduled to open in 2018. She is thrilled to be working with Sutter Health again and especially with the Rec & Park Department in her own backyard. While the gatherings will surely build connections between the facility and the community, Emily declares that the emphasis is on family fun. She says that this will be the urban version of the drive-in with neighbors packing a picnic and families coming together to mingle, the kind of opportunity we need more often. For safety and consideration, lawn chairs are discouraged. Alcohol is prohibited at Upper Noe. Children were back in force upon the oddly curved post in the playground known as the Spica. This feature had been idle all winter after the bearings wore out, a testament to its popularity. We were looking at either buying an entire new item at a steep price (don’t ask – it will just make you upset) or waiting until July for Rec & Park to put in for a replacement in the annual budget cycle. The speed at which the new Spica appeared is impressive. Thanks go out to our Facilities Coordinator Cheryl Woltjen for making this a priority. Please prevent children from marking up the playground equipment, walls and posts. Playing with chalk on the sidewalk is fine but vertical surfaces need to stay clean. Because of the drought, Rec & Park workers cannot use water on sidewalks, walls and other hard surfaces. Furthermore, the lack of rain means that the chalk does not wash away naturally. 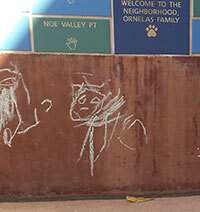 The task falls on volunteers to scrub it off since leaving chalk in place encourages escalation to crayons, markers, and worse –graffiti vandalism. Visitors have happily noticed a greening of the 30th Street slope and gardens. Gardeners have finally turned the hoses on the brown grass and dying shrubs, and they have cheerfully responded. We now have a healthier lawn for baseball viewers and picnickers to enjoy. Calls to 311 - SF Customer Service Center made a difference. Every second Saturday of the month from 9 a.m. to noon, neighbors are invited to help maintain our beautiful gardens. An hour or so of your time can make a difference. Work parties are fun for the whole family and a great way to get to know your neighbors. 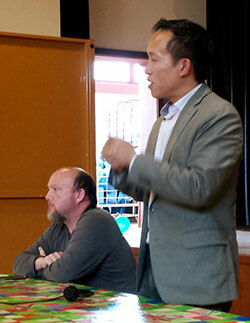 Assembly Member David Chiu (shown right with NV Democratic Club president Todd David) addressed District 8 residents in the Upper Noe auditorium on August 20. He took questions from the audience, talked about the complexities of passing legislation at the State level, and stressed the need to approach housing and homelessness on a regional level. This event was part of efforts David is making to meet with and listen to all of his constituents. Sign ups continue. Fall programs began at Upper Noe on August but many classes accept drop ins anytime and some classes have not yet begun. For details, see the Registration Information page, inquire at the Rec Center office or just drop in on the class. See the updated Fall Daily Schedule. The dust has settled on a vexing issue. Rec & Park gardeners have examined the dog run sprinkler system and reported the problem. In the meantime, they have a work-around to run them a few times a week to keep the gravel surface sanitary and properly conditioned. Credit goes to user complaints and direct intervention by the Ladybug Gardeners. For too long the sprinklers had not run at all. As a result, dog claws continuously raised fine dust to the surface where it blew away and all over people and pets. Sprinkling compacts fine particles below where they form a barrier between the gravel and the soil. 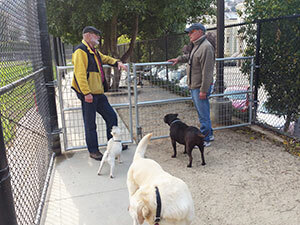 right: Neighbors chat over the recently installed gates. Help shape up the park for fall. Presentation and discussion of local and state initiatives on the November ballot. 4:30-6:30 pm - Eureka Valley Rec Center, 100 Collingwood St.